An air of quality and majesty hangs over this splendid revival of Opera Australia’s 2003 production of Otello. Verdi’s unrelenting psychological drama, with libretto by Arrigo Boite, plays to our tendency to root for the machinations of the villain. Even though Iago might be viewed as a man who just believes he is right, when his ruthless persecution leaves with the stage littered with corpses he can really only be seen as having the blackest of hearts. Updating the action to a 20th century war-torn European province, director Harry Kupfer keeps the stakes high. The constant threat of attack playing foremost on his mind, General Otello is susceptible to Iago’s insidious machinations, a weakness he realises far too late. 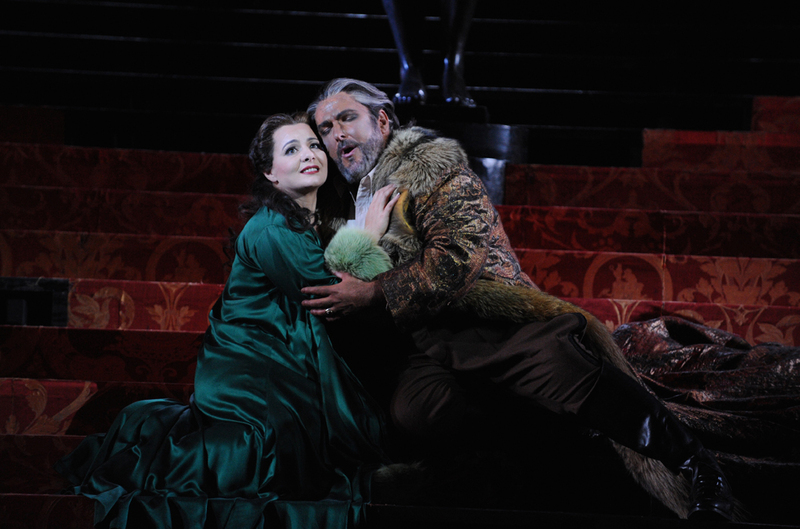 Neither Verdi and Boite nor Kupfer allow so much of a second of levity as relief from the unstinting drama. The perilously tilted angle of Hans Schavernoch’s striking set cleverly creates a deliberately off-kilter playing field for the tense action. A huge black staircase is seen in a calamitously war-damaged condition, with red and gold trimmings and massive Atlas statue hinting at the regal site it once was. The setting allows for a brilliant opening scene, in which scores of refugees spill down the stairs under the flashes of lightning and crashes of thunder. The splintered staircase also provides plenty of hiding places for eavesdropping and spying. The impact of the set wears off, however, as the opera progresses, and the intimate fourth act, written for the bedroom of Otello and Desdemona, makes little sense out in the open, public arena. Revival director Roger Press makes excellent use of the full scope of the space, having actors traverse up and down the stairs and across the full width. The Met Opera-sized chorus is also used to excellent visual effect in terms of making the most of the multiple levels. Costume designer Yan Tax uses a palette of black and cream, with touches of military brown, allowing Desdemona, and her maid Emilia, to stand out in vivid jewel tones. Her emerald green nightgown and nightdress ensemble is particularly eye-catching. Maestro Christian Badea helms a sterling performance from the Australian Opera and Ballet Orchestra as they skillfully switch from raging storm to military pageantry to the most delicate and intimate of phrases. Chorus preparation by Anthony Hunt is masterful, the staircase setting allowing the huge Opera Australia Chorus to project a magnificent wall of sound. Acclaimed heldentenor Simon O’Neill blesses the Australian stage with his role debut as Otello. 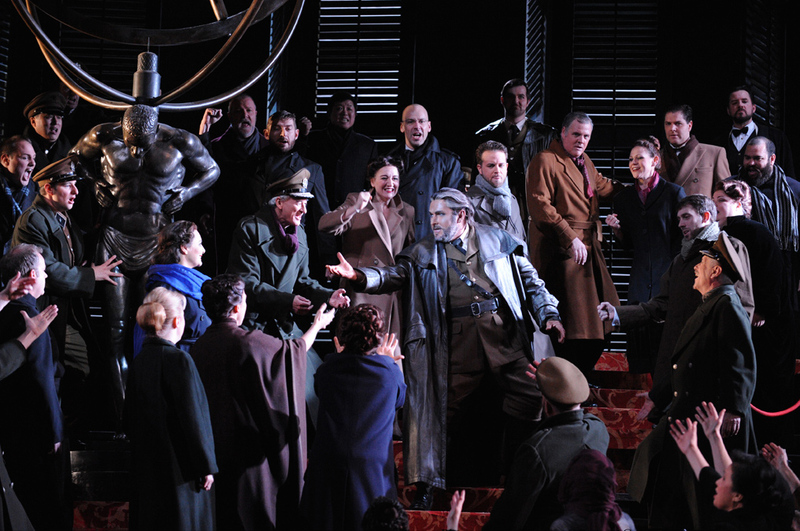 Beginning somewhat gently, O’Neill gives an expertly shaded rendition of the challenging role, the power of his voice increasing as the night unfolds. His thrilling high notes ring out with clarity. 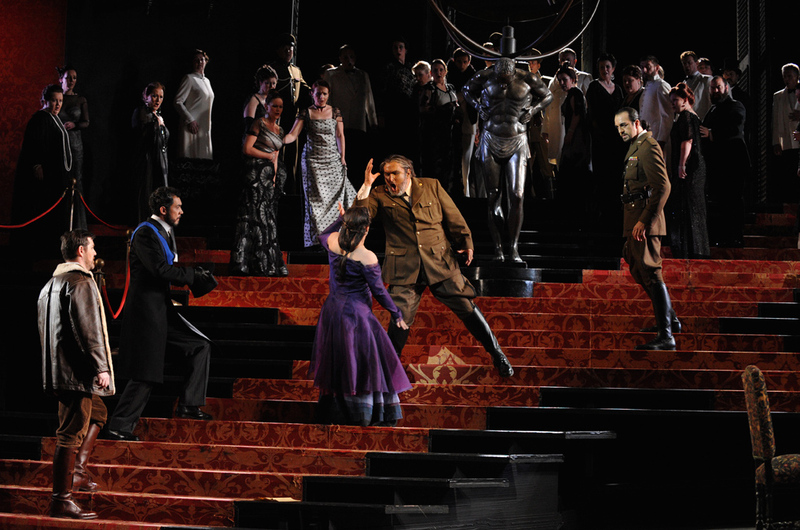 Presented as an imposing mountain of a man, O’Neill also gives a remarkable physical performance, bravely throwing himself headfirst down the stairs, in Otello’s despair, at the end of the act three. Becoming increasingly disheveled, O’Neill convincingly conveys Otello’s bubbling inner torment. Although it ultimately has no impact on the night, it would be coy not to make some reference to the difficult rehearsal process for this season. It is enough to say that the last minute arrival (five days before opening) of Armenian soprano Lianna Haroutounian has proved to be a miracle of the first order. In her auspicious Australian debut, Haroutounian proves an absolute delight. 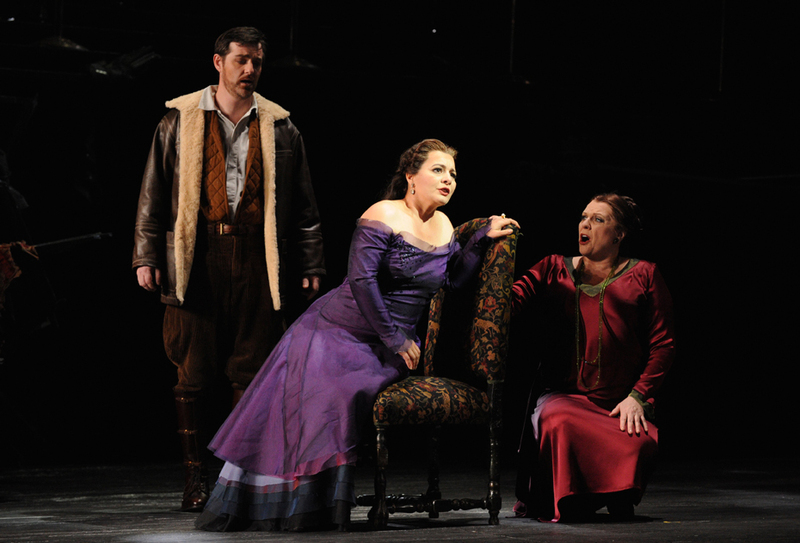 Blessed with a voluptuous soprano, Haroutounian is particularly adept at colouring her tone with the anguish and heartache of wronged wife Desdemona, easily gaining the audience’s sympathy and affection. Haroutounian’s radiant, smiling beauty allows her to make very clear why Desdemona is a prized goddess, coveted amongst men. Haroutounian’s final pair of arias, “Piangea cantando nell’erma landa” and the divine “Ave Maria,” has the audience completely under her spell. 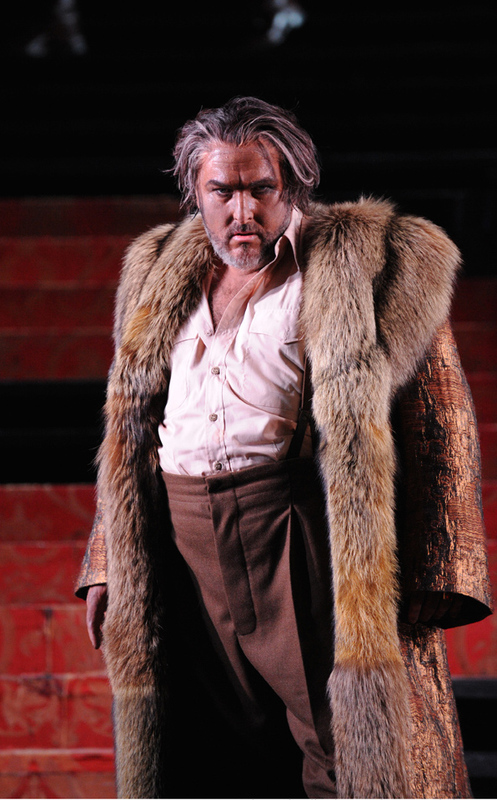 Italian baritone Claudio Sgura completes the trio of outstanding lead singers as the vile Iago. Skillfully changing his tone as Iago swerves from oily sycophant to self-satisfied villain to angry schemer, Sgura also has a face that easily takes on a malevolent shadow, adding layers to his portrayal of Iago’s abuse of those who trust him most. Solid support comes from James Egglestone, noble as Cassio, and David Corcoran, a polished Roderigo. Pelham Andrew’s unblemished bass impresses in the cameo role of Lodovico. The redoubtable talents of perennially invaluable mezzo-soprano Jacqueline Dark seem squandered for most of the night as the placid Emilia. Her moment in the spotlight comes after Otello’s climactic murder of Desdemona, when Dark is responsible for raising the height of the drama to an even greater pitch and she absolutely nails it. A compelling night at the opera. 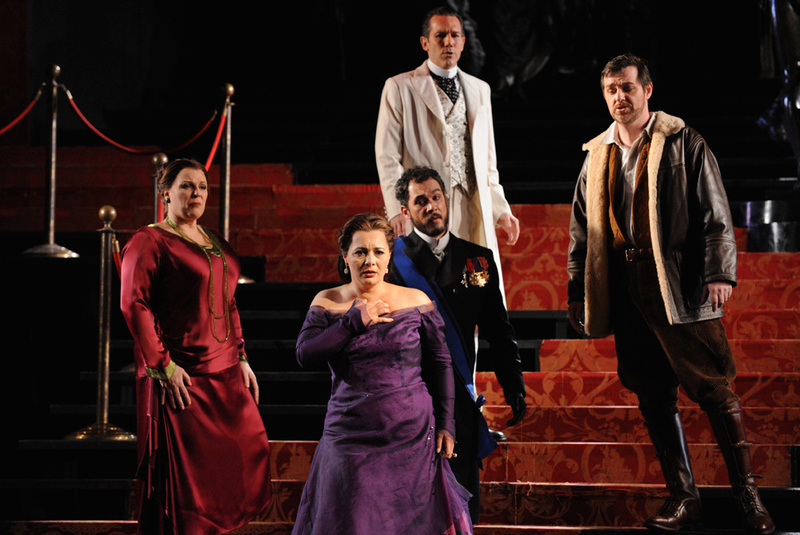 Otello plays selected dates at Joan Sutherland Theatre, Sydney Opera House until 2 August 2014.